The smartest game in the series has finally made it to PC. What is it? A remaster of a decade-old PS2 RPG in which a gang of misfits take on an encroaching empire. The little kingdom of Dalmasca has been taken over by the rampaging forces of Archadia and it's up to a couple of street urchins, a resistance leader, a knight, a sky pirate, and a rabbit lady, to battle their oppressors and save the realm. There's an airship, of course, and there are Chocobos, and you revive party members with tufts of phoenix down—so far, so Final Fantasy—but look past the mascots and you'll find the boldest, most inventive game of the series, powered by a weighty squad-based RPG system and remastered to run at high resolutions on PC. After a brief scene-setting prologue you start the game in control of Vaan, a charmless and irritating child from the streets of Dalmasca. He's hitting rats in a sewer alone, and seems determined to give you the worst possible introduction to FFXII's world and systems. As you guide him around town and into the surrounding deserts to hunt monsters you pick up companions like Vaan's streetwise pal, Penelo, and the fantastic sky pirate Balthir, whose opening line “I play the leading man,” hints at a massive lost opportunity. Once you have a full squad the combat system oh-so-slowly reveals itself, and the fun can truly begin. 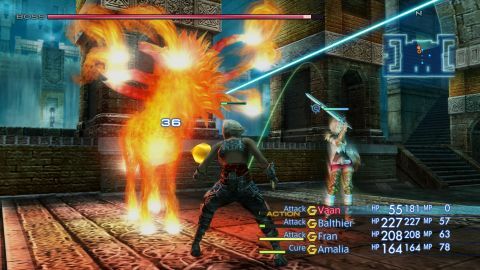 Combat differs from other Final Fantasy games in many ways. Fighting happens seamlessly as you wander around the game's open areas—no whooshing from exploration to separate battle scenes here. When an enemy attacks, everyone draws their weapons and target lines appear showing you who is engaging what. Then you're free to give direct commands to any party member, which they execute as soon as their action cooldown timer has expired. However, in the long term, Final Fantasy XII isn't a game about micromanaging individual party actions. It's a design challenge in which you tailor the group's AI to turn it into an automated, self-sustaining death ball that rinses dungeons with deadly efficiency. Once you're properly up and running, you should only need to jump in to micromanage in times of crisis, and otherwise spend your time admiring your handiwork as entire fields are scrubbed clean of monsters in minutes. You edit each individual's behaviour between battles with the gambit system. This looks like a list of commands which you can customise and then drag around to create an order of priority. When combat starts that character will move through these commands from top to bottom. Let's say you're building a healer. You might create a top priority command that makes them heal allies below 20 percent health. Slide that to the top of the gambit list and they will perform that action when possible before moving on to the next command, which might be to cast protective spells on your key damage dealers, cure ailments, or attack enemies. You can buy new gambit commands from shops throughout the game, which let you tailor your squad's AI more intricately. You can arrange gambits to instruct a squad member to detect fire weakness in enemies and respond with fire magic, for example. Or you might instruct another character to cast protective shields and spell-reflecting buffs on the rest of your party. Once you have enough party members, and enough gambits, setting up a web of buffs and detailed attack commands is an absorbing and rewarding process. I have played through the game multiple times over the course of its life, and each time I have enjoyed building wildly different parties with new tactical approaches to combat. The license board is a big part of this appeal, allowing you to cast any character in any battlefield role. When you start levelling with a character you pick a board from a selection of 12, each of which represents a combat archetype. A close combat brawler will do well with the 'foebreaker' board, which lets you specialise in heavy melee weapons. The 'white mage' board gives you access to lots of recovery spells very early on, which makes it a good choice for your healer. Once you have picked a board you use license points—earned with every kill—to unlock new squares on the board. These can give you extra gambit slots, health boosts, buffs to certain types of damage, and the skills you need to wear better armour and wield better weapons. The boards work as big, expansive skill trees, essentially. Together the gambit system and license boards make levelling and developing a party a satisfying creative exercise. Even though Balthir turns up with a gun and Vaan has a knife, you're free to throw out the game's idea for each fighter entirely. Frenzied, speed-enhanced Penelo with a greatsword? Why not. Final Fantasy XII's greatest problem is that it takes so long to get good. Without the full complexity of the gambit system behind it, combat for the first third of the game feels passive and boring. The plot frontloads a lot of repetitive sewer sections and these boxy dungeons haven't aged well since the Playstation 2 version came out in 2006. The remaster improves matters, to an extent. Firstly, this version has a fast-forward command that lets you double or quadruple the speed of the action with a button press. This brute-force gets you through the duller dungeons quickly, and clips many hours of grinding out of the game, thank goodness. Also, while the dungeon layouts can be tedious, Final Fantasy XII's excellent art direction still shines overall. The remastered background textures can look a little grainy and odd on a PC monitor close-up, but the the character textures have been updated well and the orchestral score has been re-recorded. When fights are in full flow and you start unleashing the most powerful summons, ultimate 'mist' attacks, and top spells, FFXII is a handsome game. It ran flawlessly at 60 frames per second on my 1080p monitor with a GTX970 (run it in borderless windowed mode if you're having problems with the game running too fast on a monitor with a high refresh rate), though struggled a little on a 4K monitor until I had turned a few settings down. It's a decent port. XII sits in an awkward place in the Final Fantasy canon, sandwiched between the FFXI MMO game and the restrictive rebound of Final Fantasy XIII. Its opening third does it no favours, and the confused plot never engaged enough to pull me into the inter-kingdom squabbling. If you approach it as a vehicle for party experimentation then it's easy to fast-forward to the quality extra-curricular stuff, like the hunting lodge that lets you fight up through a series of increasingly intense monster battles. The gambit system is so good it deserves to be spun off into its own RPG sub-genre. If you like theorycrafting, clever levelling systems and lavish worlds, this could easily be your new favourite Final Fantasy.